When it comes to 460cc drivers, even at the highest level of competitive golf, there are plenty of choices. And Titleist continues to be the brand trusted above all others. Now there's the next evolution of 460cc driver technology, the new Titleist 907 drivers. 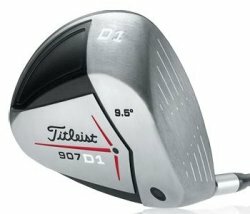 The Titleist 907D1 is a multi-material 460cc driver with a high moment of inertia (MOI) for increased DISTANCE WITH FORGIVENESS and outstanding playability. From Anonymous of Ellensburg, Washington on 6/27/2007 . I hit this club long and straight everytime.